The University of Hannover[nb 1], officially the Gottfried Wilhelm Leibniz Universität Hannover, short Leibniz Universität Hannover, is a public university located in Hannover, Germany. Founded in 1831, it is one of the largest and oldest science and technology universities in Germany. In the 2014/15 school year it enrolled 25,688 students, of which 2,121 were from foreign countries. It has nine faculties which offer 190 full and part degree programs in 38 fields of study. 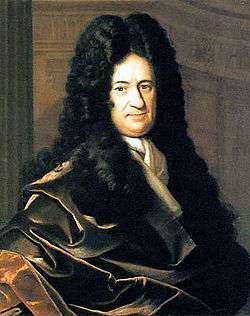 The University is named after Gottfried Wilhelm Leibniz, the 18th century mathematician and philosopher. The roots of the University of Hanover begin in the Higher Vocational College/Polytechnic Institute (German: Höhere Gewerbeschule/Polytechnische Schule), founded in 1831. In 1879 the Higher Vocational School moved into the historic Guelph Palace, the Welfenschloss, which was specially converted for the purpose. Later, the Higher Vocational School became the Royal College of Technology (German: Königliche Technische Hochschule). 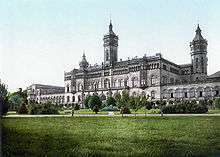 In 1899 Kaiser Wilhelm II granted the College of Technology a status equal to that of universities and the right to confer doctorates. The College was reconstructed in 1921 with the financial support of the College Patrons’ Association. There were three faculties: Mathematics and Natural Sciences, Civil Engineering, Mechanical Engineering. In 1968 the Faculty of Humanities and Political Science were founded and the "College of Technology" became the "Technische Hochschule" ("Technical University"). Between 1973 and 1980 the faculties of Law, Business and Economics, the formerly independent Teachers Training College were added to the University and the "Technical University" was renamed "University of Hannover." Student numbers exceeded 30,000 for the first time in 1991. On the 175th anniversary of the institution in 2006, the "University of Hannover" was given the name "Gottfried Wilhelm Leibniz Universität Hannover." While 64 pupils first attended the Vocational School, today the university now has around 25.700 students, more than 2.900 academics and scientists, and 160 departments and institutes. The Senate of the University voted in April 2006 to rename the University of Hannover to "Leibniz Universität Hannover". Following agreement by the Leibniz Academy on the use of the name, the "Gottfried Wilhelm Leibniz Universität Hannover" received its name on the 360th anniversary of Gottfried Wilhelm Leibniz's birth. The brand of the university is "Leibniz Universität Hannover." The old logo of the University was inspired by the Massachusetts Institute of Technology. The current logo is a stylized excerpt from a letter to Duke Rudolf August of Wolfenbüttel, in which Leibniz presented binary numbers for the first time. Nine faculties with more than 190 first-degree full-time and part-time degree courses make the university the second-largest institution of higher education in Lower Saxony. The university staff comprises 2930 research and teaching staff, of whom 321 are professors. It has 1810 additional employees in administrative functions, 90 apprentices and some 1400 staff funded by third parties. The campus of the university is spread over 160 buildings occupying 322,700 m2 of floor space. The library was established on the founding of the Höhere Gewerbeschule/Polytechnische Schule in 1831. It expanded into an important collection as the institution evolved from a vocational/technical college into the full University. The removal of the books into storage during the Second World War secured valuable old stocks that became a unique national collection of scientific and technical literature in postwar Germany. This was the basis on which the library of the Institute of Technology (German: Technische Informationsbibliothek) was established in 1959. Today the collection forms the heart of the German National Library of Science and Technology, which is the largest institution of its kind in the world. GISMA Business School in Hannover, Germany, was launched in 1999 as a joint initiative by the state of Lower Saxony and visionary private-sector enterprises. GISMA is a privately funded, self-administering institution of higher education. The School is closely affiliated with the Krannert School of Management at Purdue University (Indiana, USA) and the Leibniz University Hannover, Germany. GISMA also collaborates with TiasNimbas Business School of the Tilburg University & Technische Universiteit Eindhoven (the Netherlands), and Central European University’s CEU Business School (Hungary). GISMA Business School offers MBA degrees in cooperation with its partners: the Krannert School of Management at Purdue University (Indiana, USA) and the Leibniz University Hannover, Germany. The degrees can be pursued either full-time (in 11 months) or part-time. Besides its MBA programs, GISMA Business School also offers tailor-made courses for managerial staff members as well as open courses. Karl Karmarsch (1803–1879), Engineer, educationalist. Ludwig Prandtl (1875–1953), Physicist and engineer in fluid- and aerodynamics, professor. Carl F. W. Borgward (1890–1963), Entrepreneur, car manufacturer, engineer, guest auditor. Walter Bruch (1908–1990), Electronics and television engineer, honorary doctorate. Erich Gutenberg (1897–1984), German economist. ↑ Hanover is the traditional English spelling. The German spelling (with a double n) is becoming more popular in English; recent editions of encyclopedias prefer the German spelling and the University uses the German spelling on its English website. The traditional English spelling should always be used in historical contexts, especially when referring to the British House of Hanover. ↑ uni-hannover.de. "Neues Corporate Design der Leibniz Universität Hannover entsteht". Retrieved 27 March 2008. Wikimedia Commons has media related to Universität Hannover.